The Nokia and Microsoft event has begun and the first device out of the gate is the Nokia Lumia 920, previously leaked images look to be spot on and here is the breakdown of the phone features. 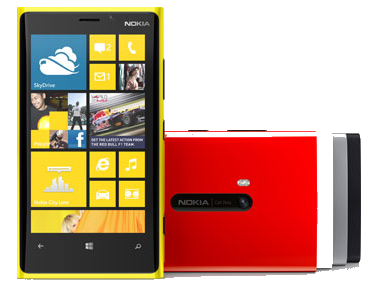 This latest flagship model from Nokia is the first Lumia PureView model with advanced camera functions and imaging features. Similar in looks to the Lumia 900, the 920 has a larger screen at 4.5-inches with curved glass over the top of it and this screen is pretty unique. The screen is a PureMotionHD+ display and has been designed to adjust the screen colour and brightness automatically depending on ambient light, so this is the next step from ClearBlack making it work really well outside. The phone is powered by a dual-core processor and comes with 32GB of internal memory, there is no expansion slot but the large memory on board should combat that. The latest Windows Phone 8 OS is onboard and this includes a few nifty features such as Nokia City Lens, Nokia Drive and updated system apps. NFC and 4G capabilities are included and the phone includes an 8-megapixel camera. The camera has some new technology for image stabilisation called “floating lens” which, according to Nokia, is more effective than optical image stabilisation. Video recording is at 1080p and the familiar Carl Zeiss optics are on board too. One of the unique features of the phone is the wireless charging facility that will be compatible with upcoming accessories. The first wireless charger to be seen is the Fatboy pillow and this wireless charging device will give your phone the extra juice it needs when placed upon it. Nokia has announced a partnership with the likes of Virgin Atlantic, Tea Leaf and Coffee Bean to embed the pillow into Virgin lounges and coffee tables at the drinks chains so you can charge your Lumia 920 in these locations too. The phone will be launched in white, yellow and black – no confirmation on pricing or when it is likely to hits the shops so watch this space.